1. One cannot violate the Constitution of Ukraine, our Basic Law, as the 1st article of the Basic Law proclaims Ukraine to be a social state. Since the notion of social state (state of common welfare, state of common prosperity) is understood under the political system in which every citizen is guaranteed a worthy standard of living and wide range of social benefits: employment, housing, medical care, education and pension, we cannot assume a giant gap between the minimum pension scale (690 UAH) and maximum pension scale (40 000 UAH and more) to be normal. 2. Article 46 of the Constitution stipulates that the pension or any other kind of social benefits is the main source of livelihood. 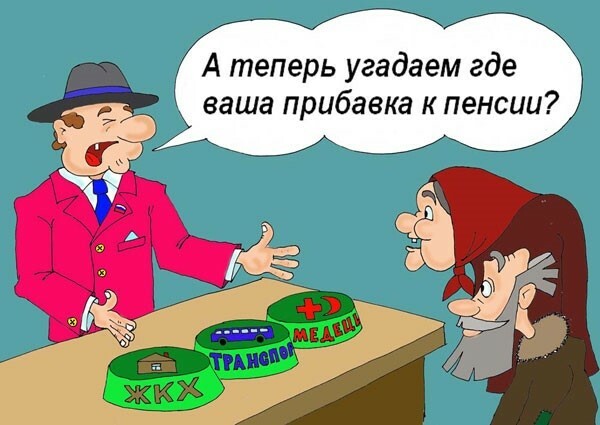 The pension should provide a living standard that is not lower than subsistence level established by law.But the established subsistence level does not meet the real price level for foodstuff, medicines, services and industrial goods.So the article 48 of the Constitution is violated, which stipulates that everyone has the right for worthy standard of living for oneself and the family, including the sufficient food, clothing and housing. Since the state is unable to provide the proper implementation of the Constitution regarding the worthy living standard of its citizens, it has no legal right to deprive the retirees of work. So the recommendations of the IMF and the World Bank with the view to the suspension of pensions for working pensioners in Ukraine is unacceptable, with the exception of those employees who have a pension 10 or more times higher than the minimum one. All are equal, but some more equal than the others. 3. One of the pillars of the legislative support for the pension reform should be the adoption of law About the Prohibition on Discrimination against the Senior Citizens in Ukraine. The bill was developed by Ukrainian Association of Retired Persons and presented at the plenary session of Verkhovna Rada of Ukraine in November 2005. There is no social justice in the pension system without adoption of the stated law. 1. Reforms provided at any field and especially in the social sphere decrease the ratings of politicians, prompting them to avoid radical and unpopular decisions, as the pension reform requires determination, courage, unconventional approaches to the resolution of the problem. One of the unpopular decisions is the increase the retirement age. To avoid the shock therapy in the near future, it is better to start the gradual increase of the retirement age (eg. 2-3 months annually). whatever this age may be. 2. The scale of labor pensions actually depends on seniority and the amount of the paid pension contributions. This issue does not provide incentives to long-lasting work. The working retiree must be either fully exempted from the contributions to the pension fund or have his pension recalculated with regard to amounts withheld from his salary. Legislation in the field of social policy should be transferred from administration to the principles of creation of incentives for both retirees and employers.The legislation should create profitable conditions for employer to employ retirees. 3. UARP believes that is high time to cancel a number of pension laws that cause social inequalities. But the trouble is that this cancellation can be initiated only by either people’s deputies or civil service employees. However, it is disadvantageous for them above everything. So it turns while criticizing the solidary pension legislation, they do not wish to refuse of such corporate solidarity. 4. It is time to provide full capacity public control over the preparation of those bills related to social problems, especially pension reform. The role of civil society in legislation should be considerably increased. 5. It is necessary to accelerate the transition to the 3-level system. Created dwarf pension funds are unable to provide that level of accumulation system that meets the task of reform.Perhaps a number of public pension funds are to be established at public expense (interest free loan), which would serve the public servants and the employees of the public sector. These funds with a solid financial base would serve as a catalyst to speed up the pension reform. The right to participate in the fund should be given to everybody. Pension is a swan song of wages. 1. When introducing 3-level system special prudence is required because of the lack of effective control over the work of non-state pension funds. Guarantee fund of pension contributions should be introduced in the non-state pension funds. 2. Provision of pension must be enacted legally as follows: certain amount (e.g. quarter) of the paid pension contributions should become the property of the citizens and inherited closest relatives. 3. There is a need to introduce a progressive scale of contributions to the pension fund for joint appointment in order to render the employees the incentives for work. 4. Very serious gap in the pension legislation is that the proposed reform does not take into account the interests of those who are 40 years old and more, and focused solely on those who are currently 20-25 years old. 5. It should be done a sharp turn from the current senseless system of medical care to health insurance, which will allow retirees to receive real treatment instead of spending their last savings on expensive drugs and bribes for the so-called free medical care. 1. It is necessary to straighten up the distribution order of pension funds in the country in line with Ukraine's status as a social state, and then the Pension Fund will receive the substantial reserve for pension increase. It should be stated a fact that the distribution of pension funds in Ukraine is performed in terribly unfair proportions. One million of 14 million senior citizens get almost as much as the rest 13 million seniors! 2. It is necessary to amend the law On Subsoil and to optimize the taxes form those using subsoil. To date we believe the law is unjust with regard to the people who should actually own the subsoil. Each extracted liter of mineral water, every ton of extracted deposits of ore, sand or gravel should be taxed. The cost of licenses for mining does not exhaust the full range of problems associated with the use of subsoil. Legally established tax should go to the pension fund. 3. It is necessary to proceed to taxation of the property, especially that one that belongs to the rich. The owner of the apartment or holiday home of 200 square meters or more, the garage of over 50 square meters or land plot of more than 1 ha must the pay tax to the pension fund for real estate and land plots (the exception can be made only for farmers receiving the land share up to 2 ha). 4. For many years the Ukrainian Association of Retired Persons is trying to convince senior management of Ukraine in the need for the other sources of the Pension Fund, which requires, inter alia, to introduce at the legislative level taxation of offshore operations, through which light-fingered businessmen illegally withheld from the state huge sums outstanding contributions to budget, including the Pension Fund. One can brisk up the pension reform in Ukraine only by means of active complex considered actions.But we note again: both public organizations and state institutions are to be involved in the work.Ukrainian Association of Retired Persons may join the work of public councils under the government and the President Administration while contributing to the legislative potential.